We see having a baby as one of the happiest times of our lives. For around one in five new mums though it means developing mental health complications ranging from postnatal depression to psychosis. When everyone around you expects you to be overjoyed it can feel impossible to talk about what's really going on. That's why I was so pleased to meet Olivia this week – author of the popular Baby Bible blog and mum-of-two, she was diagnosed with postnatal depression and psychosis six months after the birth of her first child, Éva, and is a trailblazer in the fight against the stigma that still surrounds perinatal mental illness. Olivia’s story is not unusual - around 20 per cent of women develop a mental health complication during the first month of pregnancy or after giving birth, ranging from mild anxiety to severe psychosis that requires in-patient care in a specialist mother and baby unit. Investing in excellent NHS mental health treatment is part of the solution. The Government is investing £365 million to improve specialist perinatal mental health services over the next five years, and NHS England is leading a programme of work which will help reach 30,000 more women every year. This is fantastic progress, but money only goes so far. Our society must change, we must make room for an open and welcoming dialogue for parents to talk about what's really going on: the good, the bad and the ugly. It is often these conversations and support networks that make all the difference for parents who are only just coping. Olivia told me it was difficult to admit to herself, let alone those surrounding her, that something was not quite right. But it was friends that made all the difference. Early on, visitors filled her with dread, but she told me about her “fierce friend” who would turn up and take her out for a walk, refusing to take ‘no’ for an answer and patiently waiting for Olivia to get ready. This, says Olivia, made all the difference. That’s why today I’m supporting Time to Talk day, which encourages everyone to talk more openly about mental health and what we can do as a society to support each other with mental health problems. It was Olivia’s husband, friends, a programme of talking therapy and writing her blog that helped Olivia through her struggles after the births of her two children, and she now campaigns for greater understanding and earlier diagnosis of perinatal mental illness. Olivia’s story is all too common, and as the Minister for Mental Health I am committed to making sure that every family like Olivia’s gets the support they need. Olivia has written a blog for Time to Talk day - below. Time to Talk day takes place today, Thursday February 2nd, and is run by Time to Change. It aims to get the nation talking about mental health and end the stigma and discrimination that surrounds it. Photo - Minister for Public Health and Innovation - Nicola Blackwood, and author of The Baby Bible, Olivia. If someone had told me 3.5 years ago, whilst watching demons fly around my home threatening to kill my baby girl, that I would one day be sat on a sofa in Whitehall being interviewed by an MP to help raise awareness for a national mental health day, I would have thought that you were the crazy one! However, it appears that sometimes the craziest of moments can happen when you are at your most well and lucid – The irony of this is not lost on someone who has suffered with her mental illness for the past 3.5 years, believe me! But there I was, 3.5 years after being diagnosed with PND, 3.5 years of suffering through the hardest battle of my life, 3.5 years of feeling lost in a chasm of despair and 3.5 years of not recognising who I was anymore and all of a sudden I felt right where I should be. 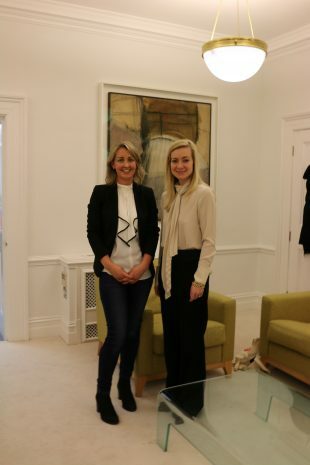 Sat on a sofa and making a difference through having a conversation with MP Nicola Blackwood (Heath and Innovation Minister) to raise awareness of the national Time to Talk day! The terms Postnatal Depression and Postnatal Psychosis are not dirty words. They are not contagious. Nothing bad will happen to you for starting up a conversation that centres around them. However, the double edged sword of a maternal mental health illness is that it silences its victims through personal fear and shame and is muted, skipped around and ignored in society thanks to stigma and fear of the unknown. This needs to stop. Time to Talk Day with the help of supporters like, MP Nicola Blackwood and all mums (those who have experienced a mental health illness aswell as those who haven’t) is vital to getting and most importantly keeping the conversation going. It is a crucial step towards making talking about our mental health as normal and acceptable as having a chat about sleep schedules and play dates at the school gates, baby groups and family gatherings. Its time maternal mental health was part of the conversation….so what are you waiting for? Author, blogger and maternal mental health campaigner Olivia Siegl (The No Bull Mum) is inviting fellow mums to start their own conversations about their Mental health through sharing their experiences on her Facebook page and blog throughout Time to Talk Day on 2nd February. You can join in here www.the-baby-bible.com and https://www.facebook.com/thebabybible/ .